Amongst many gardeners Muscari, the grape hyacinth, has a bad name its is seen as thug that spreads far too quickly. One gardener’s invasive bully is another gardener’s welcome friend and I love to see carpets of their blue flowers around shrubs, through rough grass and edging paths. All muscari flowers last well in small bouquets. When you pick them, pull them gently from the base to get the whole stem, rather than cutting through the stem. The species most people are familiar with, and the one that self-seeds with unruly abandon is Muscari armeniacum. The inky blue flower spikes grow to about 15cm (6in) tall and are at their best in March. It will grow in most situations except wet, boggy soil. It is native to meadows and woddlands in the Balkans, Greece and Turkey and is so widespread in some areas that it is reminiscent of the British bluebell. There is always far too much untidy foliage but if you grow the bulb in short grass it is barely noticeable. They have a reputation for being deer-resistant but I have seen clumps of Muscari neatly mowed by Muntjac deer. 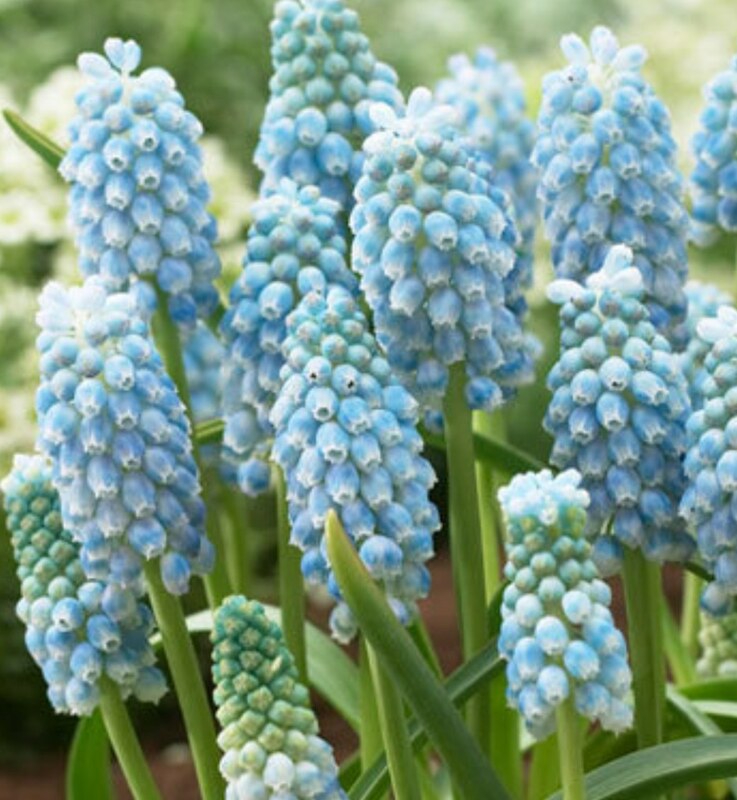 Several new hybrids are appearing including Muscari ‘Valerie Finnis’ and, more recently, ‘Muscari ‘Peppermint’. This has elegant, porcelain- blue flowers. There are several white forms, all of which are less vigorous that the blue-flowered forms. 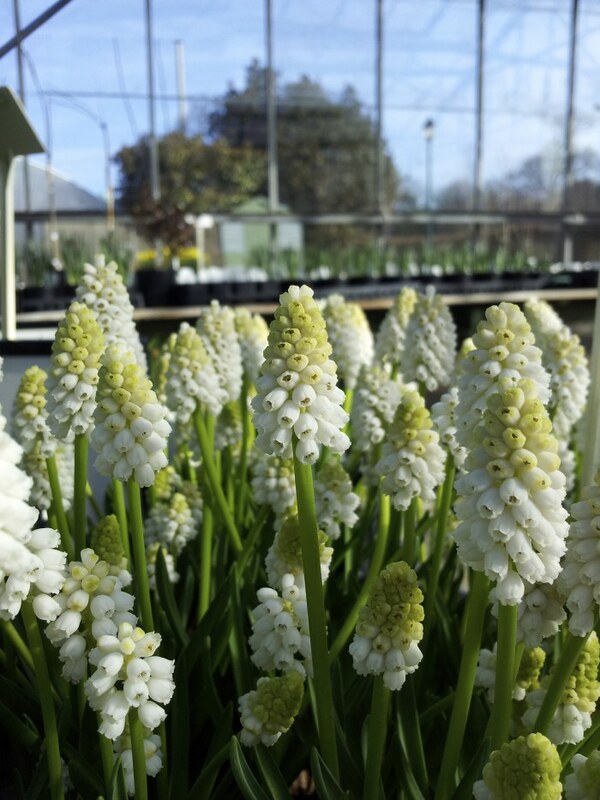 I grow Muscari botryoides ‘Album’ for its slender chalky-white flowers and sweet scent. Muscari comosum ‘Plumosum’ is a bit of an odball. The flowers resemble miniature candy-floss or cotton-candy on a stick and I find them too bizarre to be endearing. 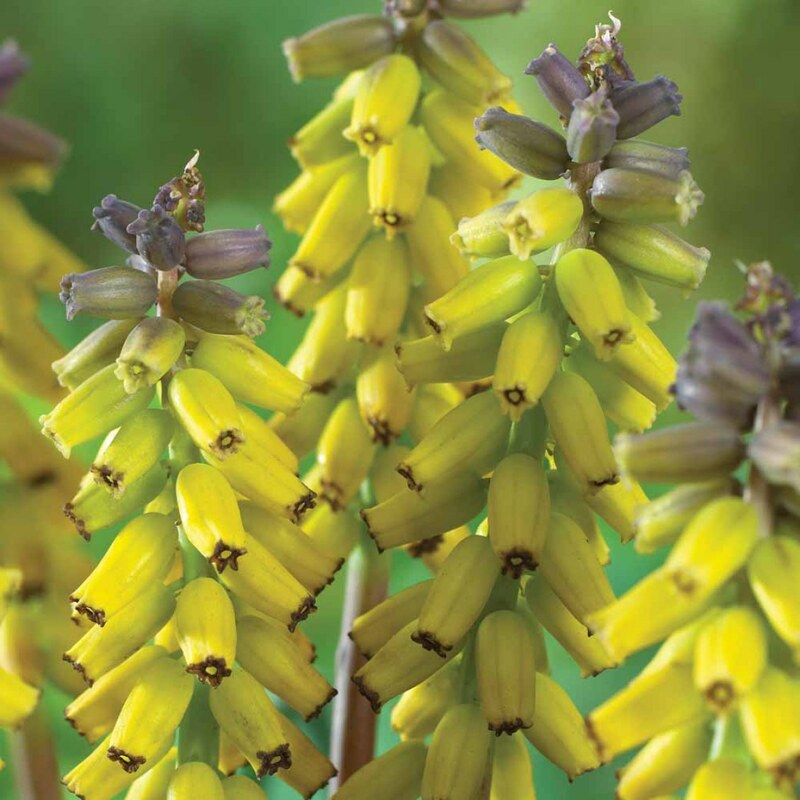 I do, though, grow another odd member of the Muscari family, the yellow and bronze flowered Muscari macrocarpum. Its been grown in norther Europe since the sixteenth century – John Gerard wrote about it in his Herball of 1597. It has very long leaves that sometimes obscure the flowers, which grow to about 12 cm (5in) tall. To thrive it needs hot dry summers and I find it does much better in south-west France that in does in the unpredictable summers of southern England.